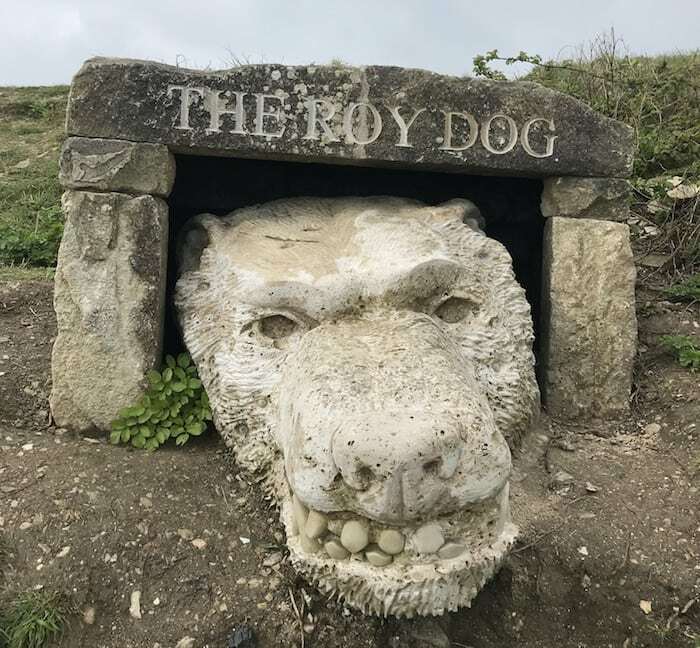 The Isle of Portland is also known as an explorer’s island for good reason. As Dorset’s most southern point, it boasts some of the most stunning landscapes along the Jurassic coast. 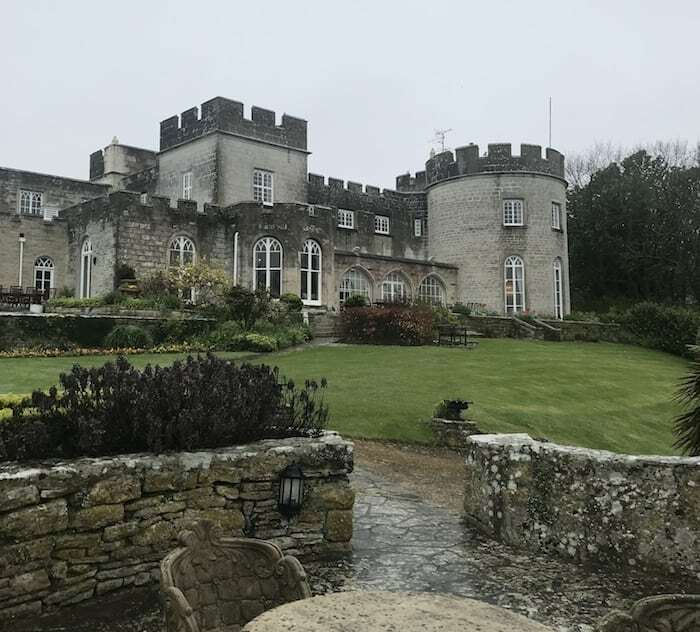 With Chesil beach just a stone’s throw away, there’s no better place to stay than the luxurious Pennsylvania Castle – an exclusive nine-bedroom rental property steeped in history. The picturesque castle is perched on a cliff top overlooking Church Ope Cove, with breath-taking views of the sea. Whether it’s a family gathering, a getaway with friends or a milestone event, the Penn provides the perfect setting for groups wanting to escape the hustle and bustle of everyday life to relax and unwind – or those looking to celebrate a special occasion in style. We arrived at the castle on a rainy Friday afternoon, but the grey clouds and drizzle failed to dampen our spirits when we were confronted by the impressive neo-gothic exterior of the Penn. As you drive into the grounds you can’t help but be taken aback by the castle’s grandeur. With stunning architecture and immaculately-kept gardens sprawling across almost five acres, the Penn is undoubtedly a extraordinary venue for any occasion. The castle itself dates back to the 18th century. It was built in 1797 by John Penn – the grandson of William Penn who founded the US state of Pennsylvania. He used Portland’s famous limestone which continues to be quarried today. The stone has also been used in the construction of buildings including St Paul’s Cathedral and Buckingham Palace in London. The outside is complimented by an equally impressive interior. From the moment you walk through the doors, it is clear the Penn places an emphasis on elegance. Upon arrival we were given a quick tour of the castle and its grounds. As we explored Penn Castle we discovered every room had its own charm and character and effortlessly blended both comfort and luxury. The balance of modern and classic styles suits such a historic building which has been lovingly refurbished. It’s clear great care has been taken in coupling the beautiful decor with antique furnishings. On the ground floor, you walk into a reception hall with a glistening chandelier and grand fireplace. A drawing room is just off the entrance hall – with Chesterfield sofa, cosy armchair and flat-screen television – and provides the perfect opportunity to kick back. There’s a library – complete with grand piano and lounge area – which is a cosy spot to settle down with a book. The lounge area is spacious enough to entertain a large party and it even provides the opportunity to eat at the circular table where the final preparations for the D-Day invasion were made in the company of King George VI, Prime Minister Winston Churchill, Free French leader General Charles De Gaulle and General Dwight Eisenhower. The dining room is generous and also has a bar which can be fully stocked at the guest’s request. The kitchen is a cook’s dream. It is absolutely huge, with an island in the centre and worktops around the edges. It is fully stocked with every utensil and piece of tableware you could possibly need. Complete with Nespresso coffee machine and all of the mod cons. The light and airy conservatory overlooks the lawns and the cove below and is definitely the ideal place to enjoy breakfast whilst looking out to sea. Our favourite place in all of the castle was the heated swimming pool which has floor to ceiling windows. It transforms into a beautiful orangery over the summer months when the Penn hosts a number of weddings. On the first floor of the Penn, there are seven spacious bedrooms. We were shown to the most opulent of all and quickly settled into our room. 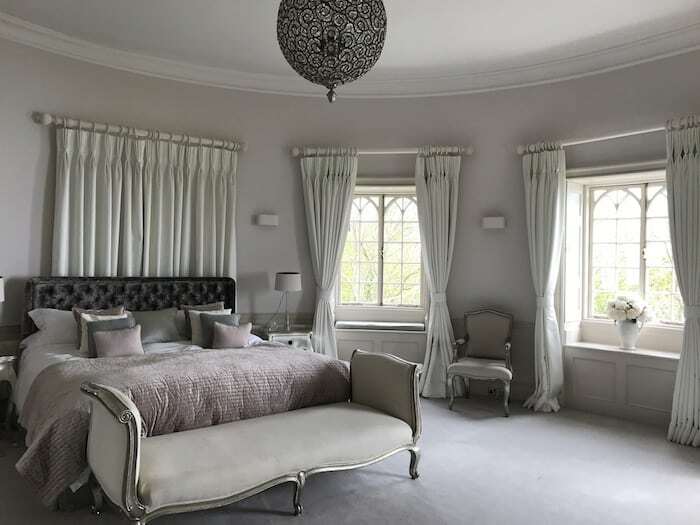 Although ‘room’ isn’t quite the right word for the Orpheus suite – a gigantic circular bedroom in the castle’s turret which exudes glamour. With a luxurious king-size bed, you are able to lie down with the windows open and hear the sound of waves crashing onto the shore below. 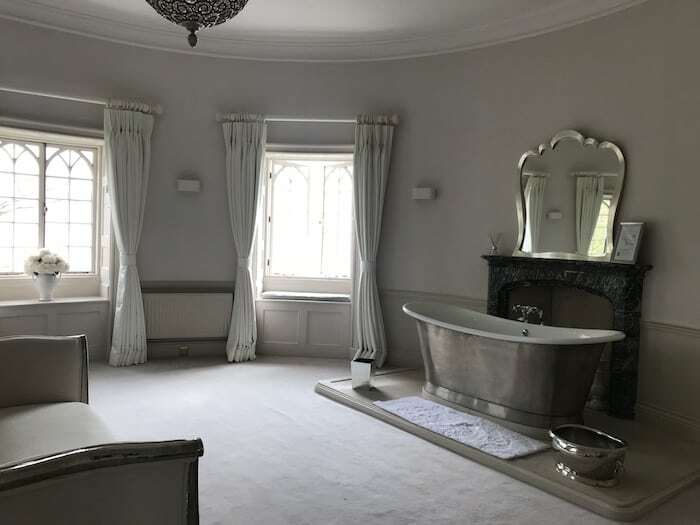 The handmade bath is the centrepiece of the room, positioned in front of a fireplace. It’s impossible to resist. We filled it straight away for a soak and there are fluffy white robes to hand afterwards to wrap up in. With three tall bay windows, there is a fantastic view of the coastline below from all angles. There is also a mezzanine floor with two additional bedrooms. Every bedroom in the castle is different with its own distinctive look and feel. With nine to choose from, the Penn can comfortably accommodate up to 20 people. Penn Castle is usually hired on a self-catering basis and guests tend to enjoy making the most of the spacious kitchen. However, guests are able to enjoy a dinner party hosted by their own private chef or experience locally renowned caterers – such as Rabbit and Rose – who will prepare and and drop off the most exquisite dishes and canapés. Penn Castle has an extensive wine list and guests are able to choose what they would like beforehand and will find their bottles chilling in the fridge upon arrival. We would highly recommend the ‘Are you game sparkling Vermentino’ or the ‘La Vidaubanaise, Comte de Provence Rose’. Alternatively, guests are able to bring their own alcohol. A visit to Portland would not be complete without stopping for dinner at the Crab House Café. If you are in the area you simply must experience the fresh seafood dishes offered at the restaurant which is a short taxi ride from the castle. 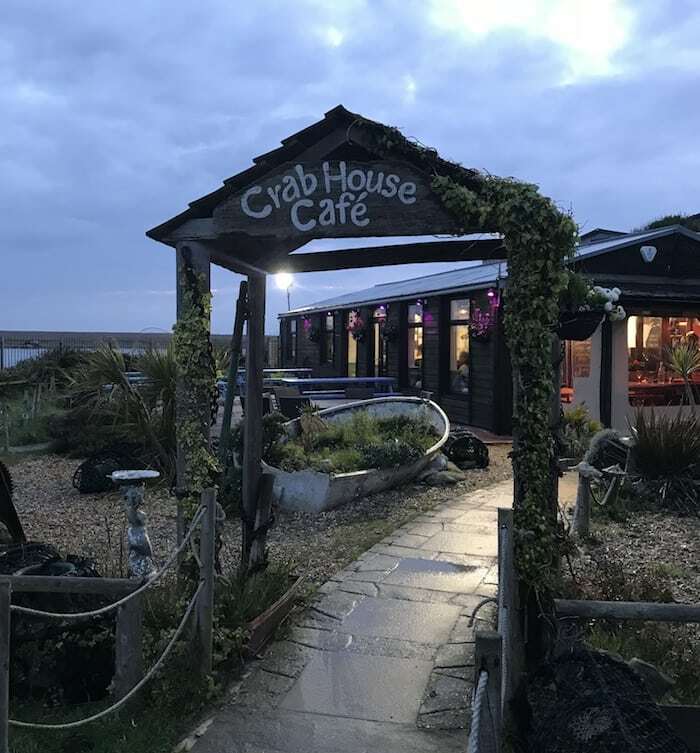 Situated on Chesil beach, it boasts it’s own oyster beds which are so close to the restaurant you can enjoy fresh oysters on the table within minutes of them leaving the water as well as the latest catch from sea. You can’t leave without ordering the oysters – we enjoyed them Italiano style (with pesto and parmesan). We would definitely recommend the poached brill fillet with muscles, garlic, chervil, shallot and white wine cream tagliatelle and also the baked pollock fillet with halloumi, sundried tomato and basil topping on a bed of lemon and rosemary new potatoes with spring greens – both were equally delicious. Portland is a small island at only 4.5 miles long and 1.75 miles wide. It is easily accessible by both road and train (followed by a short taxi ride). There is so much to see and do in Penn Castle and its grounds that you really do not need to leave it to enjoy yourself. The rooms are so luxurious, you don’t feel guilty spending a day indoors. However, Portland is an island with so much to explore. For the adventurous there’s windsurfing and paddle boarding off of Chesil beach, as well as lots of coastal walks. Portland Bill and Pulpit Rock are just a few miles away and simply have to be seen. There’s no better way to get around the island than by bike.We took a two-hour electric bike tour with Martin from Jurassic Electrics and he showed us all of the hotspots and best view points. 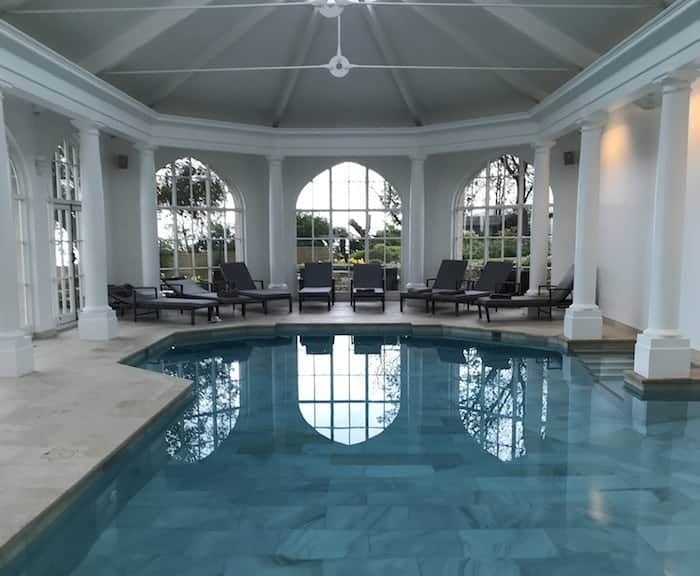 Go for a dip in the pool, tinker on the grand piano, wander around the beautiful gardens and take in the stunning views or simply lounge in the luxurious bedrooms. It doesn’t matter what the weather is doing outside when the inside of the castle is so beautiful, you won’t want to leave. The Penn is so enchanting you could get lost in it. The castle has it all to offer their guests and their helpful and informative team are able to pre-arrange anything their guest may desire – with no request too challenging. You almost feel like royalty, swanning around your own castle. In fact, members of the Royal family have enjoyed the Penn over the years. We simply couldn’t highly recommend Penn Castle more.